Advances in both imaging capabilities and postprocessing methods have broadened the way in which radiologists can assist urologists in managing laparoscopic surgery patients. For instance, the days of merely characterizing and staging a renal tumor and then later assessing for recurrent or metastatic disease are now gone. The development of multislice computed tomography scanners that can rapidly obtain thin slice image data, advancements in magnetic resonance imaging software design and coil technology, the emergence of sophisticated three-dimensional rendering methods, and the development of laparoscopic ultrasound probes have now allowed the radiologist to participate in the planning of laparoscopic surgery, guiding its performance, and then following patients for possible complications or tumor recurrence. The laparoscopic urologist must have an accurate understanding of the renal parenchymal and vascular anatomy and tumor location to preserve normal renal tissue and, thus, preserve renal function (1,2). Imaging methods must now provide anatomic information not previously considered when interpreting computed tomography scans, such as a description or demonstration of the arterial anatomy, venous anatomy, and tumor location and extension into the parenchyma or central renal sinus. The proximity of the tumor to the vascular structures and the pelvocalyceal system, and the number and course of both ureters must also be identified (3-6). Accurate surgical planning information helps to minimize postoperative complications, such as urinary leak or renal infarct, and to maximize preserved renal parenchyma. The radiologist's role has also expanded into the operating room. Imaging is frequently used during nephron-sparing surgery. 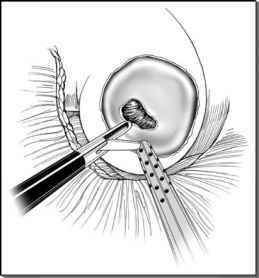 Intraoperative ultrasound is used to localize a tumor, to identify and characterize any additional lesions, and to demarcate surgical margins. Ultrasonography can be performed laparoscopically using specially designed ultrasound transducers. When ablative techniques such as laparoscopic radiofrequency or cryoablation are performed, ultrasound is used to monitor the ablation. After surgery, magnetic resonance or computed tomography is used to assess the success of an ablation and to follow the patient for complications, local recurrence, and metastatic disease. This chapter discusses the use of computed tomography and magnetic resonance as surgical planning tools specifically for nephron-sparing laparoscopic surgery, although many of these principles have been applied in several other areas of urologic surgery. Dedicated computed tomography and magnetic resonance imaging protocols, their importance for surgical planning, and the use of three-dimensional renderings will be discussed. A discussion of intraoperative laparoscopic ultrasound for nephron-sparing surgery and tumor ablation will follow. Lastly, postoperative imaging follow-up will be discussed.